The way it works is that if you buy any of the listed products at the listed supermarkets, then snap your receipt and upload it to Quidco, the cashback is automatically paid to you. Right now, Ben & Jerry’s is on the Clicksnap list and will be until 30/03/14. This gets you an additional 35p cashback. So that’s a tub of Ben & Jerry’s reduced from £4.49 to just £1.85. 2. Free baby shampoo (and more) from Tesco pharmacies. Did you know that the pharmacies in Tesco stores give out free goody bags upon request? Just go and ask the pharmacist! A little digging reveals that the bags are available from all the Tesco pharmacies but are subject to availability (i.e. grab ’em while you can), and the goodies inside change every month. According to the UK Couponing website, this month’s bag includes a full-size bottle of £2.50 Cussons baby shampoo. Well, that’s one answer to my thrifty shampoo SOS! The March bag also contains a voucher for 50p off pantyliners, a voucher for £1 off a2 milk, plus additional samples and goodies for tots: a carton of toddler milk, an Ella’s Kitchen pouch, Metanium barrier ointment and Dove moisturiser. 3. Free copy of In Style magazine. Fill out the form and you will be sent a free issue of In Style magazine, which normally retails at £3.90. As with all freebies of this type, do check out the terms and conditions of the offer before blithely signing up. In this instance, somebody from the magazine publishers, IPC Media, will telephone you to confirm your address details. By signing up for the freebie you also agree to IPC Media adding you to their marketing list. Not a problem if you are indifferent to junk mail and have an alternative email address for deals, offers and so on. But have a read anyway. 4. Free burger from Gourmet Burger Kitchen, with the Paypal phone app. If you install the Paypal app on your phone, you can get a free £6.75 burger from Gourmet Burger Kitchen. The offer is limited to one voucher per person, and ends on 17/04/14. To redeem, open the Paypal and press the “Save This Offer” button, then use the fancypants new Paypal app to pay in Gourmet Burger Kitchen. Obviously, you’ll need a Paypal account for this one to work. 5. £5 off a £40 spend at Aldi. Buy a copy of the Mirror newspaper (or the Daily Record in Scotland) today, Thursday 27/03/14, and you’ll find a voucher for £5 off a £40 spend at Aldi supermarkets. The newspapers run these every once in a while, and I always like to snip them. On the Aldi UK Facebook page, fans have been sharing their tips for making the most of these vouchers: buy two newspapers and use the vouchers a few days apart, on two shops, to get £10 off an £80 shop. Or do one big shop and ask the cashier to stop when the first receipt hits £40, before continuing on a separate receipt. And tell the cashier about your voucher(s) before they begin ringing items through, as apparently they may get the hump otherwise. 6. Free box of Cadbury Say It With Flowers Thank You Chocolates. Another smartphone special: if you have the CheckoutSmart app on your phone, you can get a free box of Cadbury chocolates in time for Mother’s Day on Sunday. These are the flower-shaped ‘Thank You’ chocolates, which are currently retailing for £1 a box at Asda, Sainsburys and elsewhere. CheckoutSmart works like Quidco Clicksnap: after you buy one of the products on its cashback list, you upload the receipt and the cashback is paid straight into your bank account or Paypal account. Right now there is a cashback offer of £1 on these boxes of chocs – so buy the £1 box, upload your receipt and effectively get your money back. This offer ends at 11.59pm on 28/03/14. 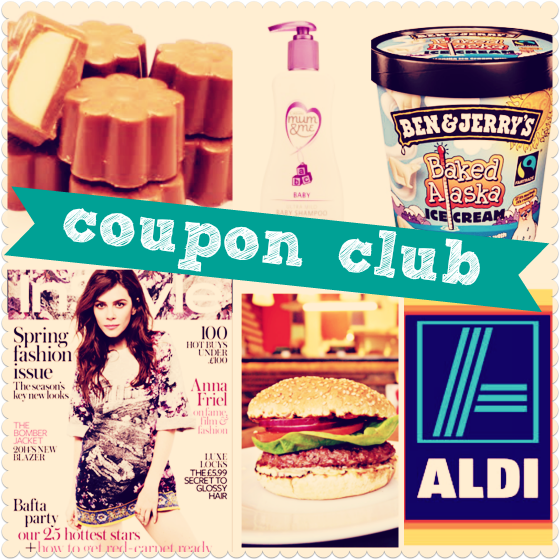 Typically I see the aldi coupon offer after the event!! Hey ho! I have a feeling that Ben & Jerry’s may be purchased this weekend!